How Fantastical Is the Fantasy? The fantasy transit map of the Bay Area I brought up on Wednesday had me thinking a fair amount about Marin’s transit options. Though we are typically the odd county out when it comes to fantasy transit improvements – though Napa certainly gets the short end of this particular map’s stick – Brian Stokle’s map adds two thoughtful improvements to the county’s transit system, and I think we’d do well to explore them, as well as a third. I should mention that I appreciate the value of bus-only lanes to a degree, but in suburban settings it is sometimes better to mix them with three-person carpools as well. In Northern Virginia, the casual carpool system functions as another transit system, vastly improving the efficiency of private cars and, therefore, the existing car-based infrastructure. Mixing buses and cars isn’t always the best idea, but I think for Marin it makes perfect sense, both for political and practical reasons. The 29R rapid bus line runs in a kind of loop between Fairfax, San Anselmo, Greenbrae, Larkspur Landing, the Canal, downtown San Rafael, Miracle Mile and finally back to the Hub, where I assume it would turn around. Rapid bus isn’t the bus rapid transit (BRT) system that we’re used to hearing about – it doesn’t have its own lanes or stations. Rather, the rapid bus concept functions as an express, limited stop bus with some structural changes beneath the surface, mostly to how the bus handles intersections. These, along with high frequency (every 15 minutes, maximum), makes the bus a viable alternative against the car. Even without the frequency improvements, adding speed to a bus line makes it less expensive to run and more attractive to potential riders. The 29R route makes sense. The Fairfax-San Rafael corridor is the county’s densest, and the narrow valley makes it well suited to a rapid bus line. The Greenbrae stretch, though not nearly as dense, is an important transportation corridor, and building a rapid bus line here would serve populations that are otherwise left behind by SMART. Greenbrae is also the kind of suburban strip that is easily converted to higher, more urbanist uses. The drawback to a rapid bus line that it doesn’t have its own corridor. Sir Francis Drake gets backed up during the morning rush between Fairfax and the Hub, as well as though Ross and near the Greenbrae Interchange, and a rapid bus shouldn’t be allowed to get stuck in that mire. The same goes for Second Street in San Rafael. To compensate, the 29R should be complemented with limited dedicated lanes. Center, the old rail right-of-way between San Anselmo and Fairfax, might be re-purposed as a rush-hour bus and carpool lane. It’s odd to imagine a surface street being carpool and bus only, but it would take a great deal of pressure off Sir Francis Drake and speed service along the corridor. Yolanda and Landsdale Stations, the old light-rail stops, could be reactivated as bus stops. Though we can’t do much about the Sir Francis Drake through Ross, the boulevard widens enough at College of Marin for dedicated lanes, though an initial segment of lanes should be built from El Portal Drive to the interchange. The Canal’s traffic patterns are less familiar to me, but it is imperative the bus not travel the narrow streets in the neighborhood, sticking instead to the much wider and straighter roads closer to the freeway. It’s close enough to the Canal that it will be accessible, but it will keep the bus moving fast enough to justify its “rapid” moniker. The ultimate cost would likely be in the tens of millions, and building such a system will require more forward-thinking on development issues, but the ultimate reward would be much improved Central Marin circulation. Much more ambitious is the 80R Bus Rapid Transit (BRT) line, running from Santa Rosa to the Transbay Terminal. Presumably, the line would have limited stop service on its own dedicated lanes for the whole trip, and would share the BRT lanes with other buses running along the corridor. It would duplicate SMART’s service between Santa Rosa and Larkspur Landing, so I wouldn’t recommend building the line north of San Rafael. A small portion of this line is already being built by SFMTA on Van Ness, which is getting its own dedicated lanes. Presumably other streets will be similarly improved, but that’s just for San Francisco. The Marin and Sonoma stretch will be extraordinarily expensive, involving rebuilt or widened freeway overpasses at minimum and possibly even new tunneling in the Marin Headlands. The first portion of a BRT system is its dedicated lanes. Ideally, these lanes will be permanently off-limits to private cars, and would certainly be off-limits to single-passenger only vehicles, and they would stretch along the entire length of the line. This includes the stretch of freeway south of Marin City, which could mean some extremely expensive tunneling projects or a narrower freeway. The Golden Gate Bridge itself would need dedicated bus lanes, which in theory would double the capacity of the bridge but would be politically challenging to build. The other portion of a BRT system is its stops. Like a train system, the stops would be located along the right-of-way; for the 80R, that would mean building new ramps directly between its lanes and freeway overpasses, where the BRT stations would be constructed. Alternatively, passengers might board the bus at the freeway level in an enclosed station, and access would be provided from the street level. These would be expensive as well, and the 80R would likely rival SMART in its costs. Once finished, though, the system would be a transit lifeline for San Franciscans working north and North Bay residents working south. As it stands,San Francisco’s Marin-bound buses leave only every hour or so in the morning, making transit commutes rather inconvenient. BRT would need to run every 5-15 minutes to make the investment worthwhile, tying the City to the county in a way it has never been. The missing piece is a strong connection from the Transit Center to the Richmond BART station and its Amtrak connections. Though today the 40 and 42 buses don’t get a lot of ridership, building a rapid bus or BRT line with direct connections between San Rafael and Richmond would be a boon to Contra Costa County, one of the largest sources of Marin’s in-commuters. A rapid bus line would start at the Transit Center and proceed along Francisco Boulevard, entering 580 at the bridge. It would make a straight shot to the Richmond station and turn around, altogether taking 30-40 minutes. A BRT line would run exclusively on the freeway, with its only stops being at Richmond, the Marin side of the bridge, and San Rafael. Such a run would take about 20-30 minutes. Though it would face the same challenges as the 29R and 80R, I like this route because it would provide easy transit between the Delta, the East Bay, and Marin while connecting Marinites with existing rail options the county doesn’t have. Given that the balance of commuting is East Bay to Marin, it might make more sense to build it as an AC Transit system, freeing Golden Gate Transit from making such a huge investment for residents outside its district. In sum, the two improvements, plus mine, are strong service improvements for Marin. Other parts of Marin could use a rapid bus system similar to the 29R, especially the Mill Valley to Sausalito corridor. Less plausible is a SMART service improvement, providing 30 minute headways all day, and even less would see the system double-tracked and electrified with 5-15 minute headways, which would likely require another ballot initiative. Fantasy maps like Stokle’s aren’t meant to be entirely practical, of course – they’re meant to make us imagine what our cities can be like, and what they might be like if we ever get around to it transit improvements. I’d like to see more of this – how about you? The San Anselmo Hub Spider Map and Graphic. Click for full-sized PDF. The greatest problem with bus lines is that nobody knows where they go. While light rail or streetcar tracks are not for every route, they do let people visually understand where transit goes. Buses, however, travel along the same roadways as cars, leaving drivers in the dark as to where they go. Communicating a route properly is extremely important to pulling back the veil of our transit system, and for showing people how transit is freedom from the car. To address this problem in at least one corner of Marin, I’ve designed a draft spider map for the San Anselmo Hub (PDF). We discussed spider maps previously; in short they are schematics of where buses intersecting a certain point run. Such diagrams are used most successfully in London where they integrate with Tube stations, although DC has made some forays into this field of late by putting bus line schematics at bus stops and huge Transit Information Displays, or TIDs, in their metro stations. (If anyone can find me a PDF of those TIDs, I’ll be forever grateful.) The point is to simplify a bus map by pulling out any unnecessary clutter and isolating just the bus routes, showing where riders can go without transferring. It is, at least to some degree, a map of the freedom available to you from a given point. My Hub spider map don’t show all the stops, as those can change. Rather, the map shows primary stops that are unlikely to change, such as Marin General Hospital. The route lines and stop circles are displayed differently depending on levels of service to give riders a clear visual of where they can always go and where they may need to check a schedule. As people generally don’t care what service they use to go from point A to B, I included all possible transfers along with easily-identifiable logos at all stops where applicable. This is best seen at the San Rafael Transit Center, which has transfers to all over the North Bay. Transfers in San Francisco, such as connections to the Cable Car, may be valuable to families that want to spend a weekday as tourists in the City. 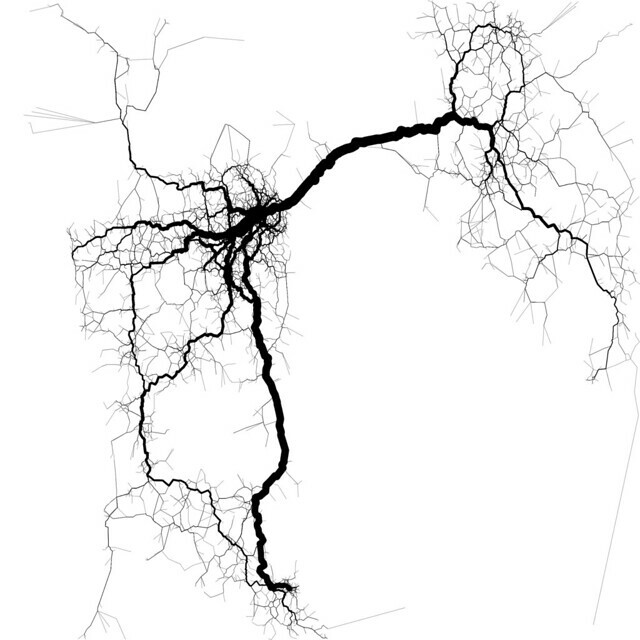 Including such data also helps riders start to build a mental map of transit beyond Marin, adding connection points to knit them all together. Plus, it provides advertising for the other agencies. I had never bothered to take the bus to the Oakland Airport, but now I know I can. If I want to take a bus to the City of Sonoma, I know I can take the 38S, even if I don’t know when. The regional transit network map is intended to be an aid in that process. Giving people a destination-based frequency guide shows riders how they could go from A to B. If I’m in San Anselmo and I want to get to San Rafael, I don’t care if it’s I take the 23 or the 22. The two lines complement one another along that corridor, and the frequency table reflects that. Given space restrictions I did not include a full-fledged timetable, but I’m assuming other signage is nearby. 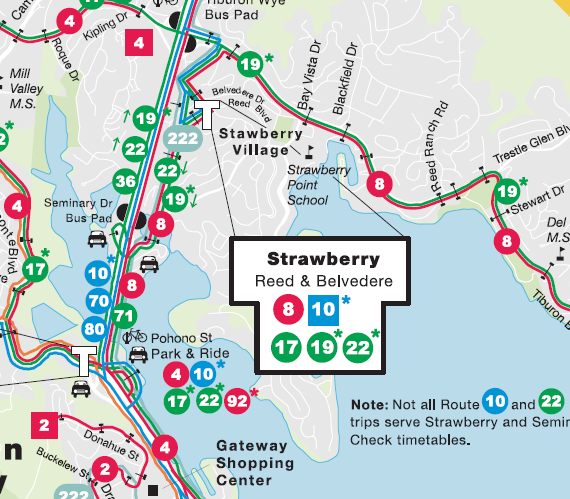 Timetables will still be necessary, as this map is for outbound trips only; the 22 doesn’t always leave from Sausalito and once per weekday winds through Mill Valley on its way north, but never does going south. These inbound trips are not visualized, and could confuse travelers. The rest of the design is taken from MTC’s TIDs (PDF), which are sadly missing in Marin. The orange i logo, the headers, the green were added to visually identify this map with those more common maps. A San Franciscan visiting San Anselmo would instantly recognize the visual vocabulary, knitting together in their mind that the Hub is still part of the regional transit network even if MUNI doesn’t run buses there, and a San Anselmoan would feel a similar sense of recognition when leaving the county. I chose to map the Hub mostly because I know San Anselmo best, but also because of the location’s flexibility. With some modifications it could be adapted for use up and down Ross Valley. Used in conjunction with broader system maps and timetables, it would be a powerful tool for Marinites. Since it’s a draft, I’d appreciate any comments and criticisms. You should know that I added a small border around the map, which is why things look a bit more squished inward than they otherwise ought. If you think it’s good enough as it is, feel free to print (and laminate!) a copy and put it at the Hub. If you do, send me a picture: thegreatermarin [at] gmail.com. I designed it on tabloid-sized paper, less than half the size of a traditional TID, so you can print it out without much hassle. What do you think? What TIDs and maps should come standard at any Marin transit hub? Marin isn’t known as a transit-oriented place, despite its deep green ideology. While fewer than 45% of San Franciscans drive alone to work, a full 74% of Marinites do. In other places, low transit ridership is due in part to the opaque nature of bus routes and schedules, and GGT is certainly opaque. What might it do to become more transparent? The first problem is one of bus routes. Many riders, if they don’t know a bus route, don’t know where they’ll end up if they board the bus. Unlike a rail-based system, riders can’t look at the rails and see where they go. Only specialized knowledge, gleaned from studying the bus map or utilizing wayfinding tools like 511.org, would allow an inexperienced user to utilize the bus system by feel. Transit centers present a special difficulty because of the plethora of options. If I want to go from Sausalito to the Seminary Drive bus pad, I first need to check to see what bus numbers depart from Sausalito, then what routes look like they might serve Seminary Drive. The 70 and 80 have asterisks next to them so I don’t know if they’ll come by Sausalito. The 10 might, too, but it also has an asterisk that says it might not serve Seminary. The 22 probably does, but getting back I might need to get on someplace else because it looks as though it veers off someplace near… Forget it, I’m taking the cab. This should not be so hard! I look at maps like this every day in a much more complicated bus network and this confused me. Any route that hits Seminary Drive from Sausalito doesn’t even always make it to Sausalito or Seminary Drive. I only know this because of side notes that say, “Check timetables.” On top of that, there isn’t an easy way to say that every X minutes a bus departs Sausalito for Seminary Drive. What if I don’t want to go to Seminary Drive but want to see where I can go from Sausalito? I’d know the end points but not the stops in between without studying the map to find the small numbers and make sure the tiny color lines match up with the numbers’ coloring. Knowing where to go has turned from easy to highly technical, and this is only a small transit center; San Rafael would be significantly worse. Without dramatically altering the routes to be more consistent, good graphic design can help lower the barriers to bus usage significantly. One of the best ways to address wayfinding is what is known as a “spider map”, a concept widely used in London’s bus system. It takes the jumbled mess of bus lines near a Tube station and charts them out to their ends, with major stops marked. It does this in a cartogram, rather than a geographic map. By removing the geographic data and showing only the most important stops, the map can most effectively highlight the most useful service data. Differing line colors or patterns show visually the various exceptions to the rules, such as partial or peak-only service, and general trends of service, such as which “trunk” the line goes along or bus headway. This grants the bus system the same clarity as a subway system and visually associates the lowly bus with the ease and comfort of rapid transit. A neighborhood spider map, showing which buses intersect an area. Click for full article. Image by Peter Dunn. Making buses work for casual riders is a perennial problem. Even here in Washington, DC, I know many people that live here months or years without ever boarding a bus. Understanding the bus system is seen as Deep Knowledge of the system’s otherwise impenetrable black box. Yet in Marin, the bus is our only mass transit option. It is imperfect, but it is comprehensive, and converting a driver to the bus will require it to be much more than the confusing map of seemingly random lines it currently is. This addresses casually knowing how to get someplace, but knowing when to show up for your bus is still a problem, one we’ll address next week.